This paper describes the development of small low-cost cooperative robots for sustainable broad-acre agriculture to increase broad-acre crop production and reduce environmental impact. The current focus of the project is to use robotics to deal with resistant weeds, a critical problem for Australian farmers. To keep the overall system affordable our robot uses low-cost cameras and positioning sensors to perform a large scale coverage task while also avoiding obstacles. A multi-robot coordinator assigns parts of a given field to individual robots. 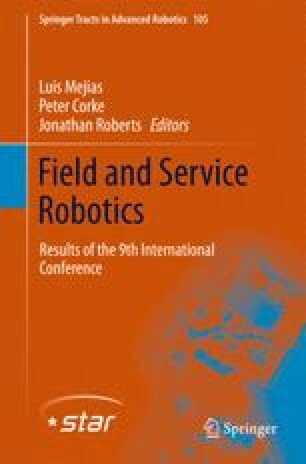 The paper describes the modification of an electric vehicle for autonomy and experimental results from one real robot and twelve simulated robots working in coordination for approximately two hours on a 55 hectare field in Emerald Australia. Over this time the real robot ‘sprayed’ 6 hectares missing 2.6% and overlapping 9.7% within its assigned field partition, and successfully avoided three obstacles. This work was supported in part by the Australian Research Council Linkage Project LP110200375 “Robotics for Zero-Tillage Agriculture” awarded to QUT, SwarmFarm Robotics and The University of Sydney.